All the traditional arts from Polynesia Micronesia and Melanesia together form oceanic art. Melanesia is Papua New Guinea Vanuatu and New Caledonia. Polynesia is all the Pacific Islands like Tonga and Fiji but also include New Zealand and Easter Island. Micronesia is just north of New Guinea. The scope and varieties of art styles in Oceanic Art is enormous. It reflects the underlying cultural and linguistic diversity of the region. For instance, New Guinea alone has over 700 languages. Each language as different from the others as English is from Russian. Many of these language groups have a distinct history culture and art style. This article helps to visually show some of the main types of Oceanic art. It aims to help the reader identify which region different Sculpture comes from. Some authors consider Australian Aboriginal art as oceanic Art. Aboriginal Art though is different again and diverse enough to be considered in its own right. Oceanic Art is some of the most valuable and sort after tribal art. I Buy Old Oceanic art and Aboriginal Art. If you have a piece of Oceanic art to sell please contact me. If you want to know what your Oceanic art might be worth please send me a JPeg as I would love to see it. It is not possible to cover the vast amount of material about oceanic art in a single article. To simplify the matter this article deals with sculptures. Oceanic Sculpture represented gods, deities or an ancestral hero. They were sometimes made free standing but are also often found as part of an object like the top of a fly whisk. Oceanic art also includes bowls weapons and Jewellery. These along with other artifacts are discussed in other articles. Most pieces of oceanic Art have a spiritual side to them. Motifs and figures were carved on objects to make them more powerful. Oceanic Art can vary in size from very small charms made to hide on your person to monumental stone monoliths. The following is a visual guide to a few types of Oceanic Art but due to the huge variety throughout the Pacific, it is far from inclusive. It is probably better to think of this article as a brief introduction to this fascinating group of art forms. If you have a piece of Oceanic Art and want more detailed information about a particular piece please feel free to contact me. Oceanic art has had a major influence on the development of modern Western art. It strongly influenced the styles of Picasso Matisse and Vlaminck. It influenced many avant-garde painters and sculptors. Many of these artists were keen collectors of Oceanic art others frequented ethnographic museums. The influence of Oceanic art coincided with changes that were taking place in Western art. Between 1870 and 1907 there was a gradual shift away from a perceptual mode of representation to a conceptual one. The “perceptual’ tradition which had dominated Western art since the Renaissance was coming to an end. This was in a large part due to photography being able to capture reality so effectively. Art was ready to evolve and indigenous art was a major catalyst. Indigenous art could present the essence of a subject and not just the physical appearance of things. It was in a large part exposure to tribal art that allowed these pioneers to develop an entirely new aesthetic idiom. Avant-garde artists became intrigued by Oceanic art. Giacometti would have seen this New Ireland over modeled skull in Basel during the 1940s. He was a regular visitor to that Swiss city’s great ethnographic museum. It is a fine line between creative adaptation and ‘artistic plagiarism’. In indigenous art the human figure is also depicted in radically different proportions from European art. The head is often disproportionately large. The organization of the body bears only an indirect relationship to its muscle and bone structure. It was different, unrealistic and yet it still worked. Avant-garde artists realized color in Oceanic art was often integral to sculptural form. The removal of color would often radically alter the perceived ‘form’ of a carving. In the first decade of the 20th-century avant-garde painters and sculptors applied its lessons from Oceanic art. Gauguin,even moved to the Pacific, first to Tahiti and later to the Marquesas. In doing so, he became the first great Western artist to live for a large part of his life outside Europe. Another, illustrated by Gaugin but also many others including Surrealists such as Max Ernst and Matta, involved incorporating images and motifs of Oceanic origin into their own work. Major avant-garde artists even made adaptations in modern media of individual Oceanic pieces. The Surrealists, who rose to prominence in the 1920s, acknowledged their debt to the art of the Pacific. They produced a famous Surrealist Map of the World. This gives pride of place to the Pacific. The map represents the size of islands and continents not on the basis of their actual dimensions but according their art. Hawaiian free standing sculpture made for tribal use is exceedingly rare. Only around 150 examples exist worldwide. Sculptural Art tradition in Hawaii was directly linked to the islands traditional religion. In 1819 the island became Christian and the old gods destroyed and abandoned to rot. Oceanic Art from the Cook islands was of important Ancestral figures. These ancestors were often the first voyageurs to land on the Cook Islands. These ancestral sculptures were the main focus within the cultural enclosure. The majority of Cook island Art was destroyed along with the temples shortly after the arrival of the London mission Society by 1821. Cook island is also well known for their ceremonial Adze. Very few freestanding sculptures exist from the Austral islands but the few that there are, are superb. The islands are best known for its wonderfully carved Austral island Paddles and drums. Free standing sculpture from the Marquesas islands is very rare. 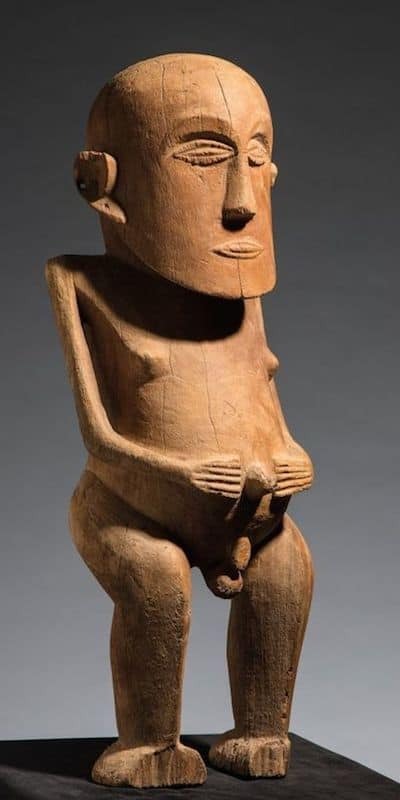 A Marquesan sculpture is normally a part of a utilitarian object. The Solomon Islands lie to the South East of New Guinea in the Pacific Ocean. Culturally Nissan Island, Buka, and Bougainville are a part of the Solomon Island Art. The two most renowned areas of Art production in the Solomon Islands are Roviana and Marovo. The Solomon islands have 67 language groups and each group was a tribe. Different tribes made different art objects. Not only does Solomon island art vary between language groups it also varies over time. Art changes with westernization through colonization and missionary actions. The Solomon Islands used to be an area with both headhunting and cannibalism between waring island nations. Solomon islands Art reflects this with much of their art associated with canoes and warfare. If you are interested in knowing more about Solomon Islands Art it is covered in a separate article. Most people associate Easter Island Sculpture with their giant stone Moai. There are however lesser known small wooden sculpture which in my opinion are even more fascinating. Wooden Easter Island sculpture has Four main types. Artistically Fiji has acted as a cultural bridge between Melanesia and Polynesia. The function of free-standing Sculpture within Fijian society unknown but most of the free-standing figures from Fiji are female. Fijian carvers are better known for making war clubs of which there are thousands of remaining examples. Some figures are in the form of dishes used by “native priests”. Fijian figurative sculpture tends to be rough and unrefined. It is however extremely rare so very collectible. The Sepik River is one of the greatest art producing areas in the world. There is such a variety of Sepik Figures and styles that it has its own article. The area has numerous different styles. Tonga is better known for its Tongan war clubs than its figurative sculpture. 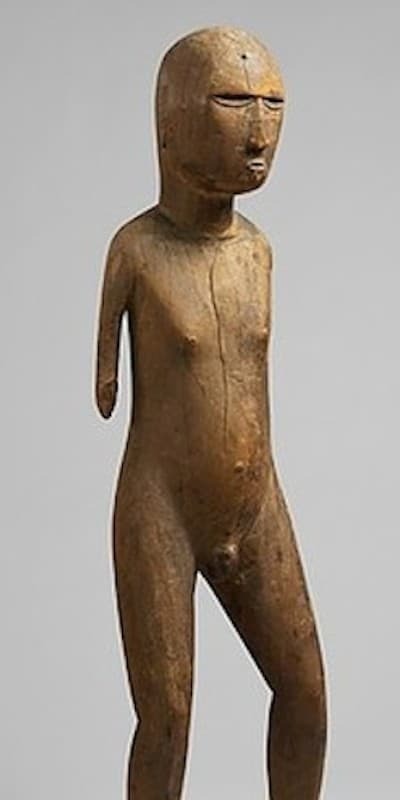 Figurative sculpture from Tonga is very rare. Sculpture is done in hardwood or sperm whale Ivory. Figures are female and have simple clean forms with superb clarity. The New Zealand Maori were prolific sculpture artists and there are whole books on just Maori Art. Maori Sculpture and Maori Art will be in a separate article. This is just some examples, so I hope you can appreciate the vast variety of oceanic art styles. The Pacific is probably the most prolific figure-producing region of the World after Africa. As oceanic art, they are extremely expressive and come in a vast variety of sizes forms and functions. It is a great pity that the majority of people who visit the Pacific only get to see the modern Tiki art produced for sale to tourists. Please take the time and make the effort to share this article on social media. By clicking any of the share buttons below you create a link from your social site to this article. Links are what google uses to calculate what information on the web is useful. By sharing this article you are letting google know you found my article / images of some value. Thanks!